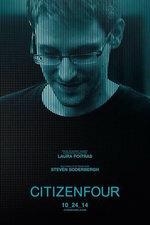 Citizenfour is a documentary film directed by Laura Poitras concerning Edward Snowden and the NSA spying scandal. Your comments will be noted. I really wish this were playing anywhere near a city I am likely to be in. I'm lucky enough to live in a city with and independent cinema that was showing the movie. It's really excellent. Laura Poitras is a skilled film maker particularly considering how constrained she was by circumstance. Snowden comes across as very personable and very smart. It's nice to know that he has been reunited with his long time girlfriend, who has moved to Moscow to live with him. Somehow seeing it on film brings home the enormity of what he did and how incredible it is that he has managed to walk away to a live of relative freedom. For now at least. There was also very much a feeling in the film that Poitras, Greenwald and Snowden were encouraging other whistleblowers to come forward. Snowden seemed very concerned for the second whistleblower who has came to Greenwald and their safety. Perhaps a sign of the pressure he has been under since his revelations where published. I'm neither American nor resident in the states so that's a somewhat appropriate use of your resources so carry on. I watched this at a preview in Oxford the week before the "official" opening. As an obsessive about this stuff already, I can't say that I learnt anything really new from it, but I enjoyed it regardless & the human side of the film was worth the price of admission - in some places the absurd really does crash headlong into the mundane. I haven't seen any publicity for this (not even a MeFi FPP?! ), and only happened to catch this today because a friend noticed it was playing nearby. Holy crap, what a great film. Now I have to find the first two works in the trilogy. It's a crime that it's not in wider distribution. There was a related FPP.